Received February 1st, 2011; revised March 5th, 2011; accepted March 30th, 2011.
operations traded on these markets. the choice made at the international level at the end . more burdensome in the future. greatly valued and better paid by customers. as adaptation in financial mark ets [4, 5]. 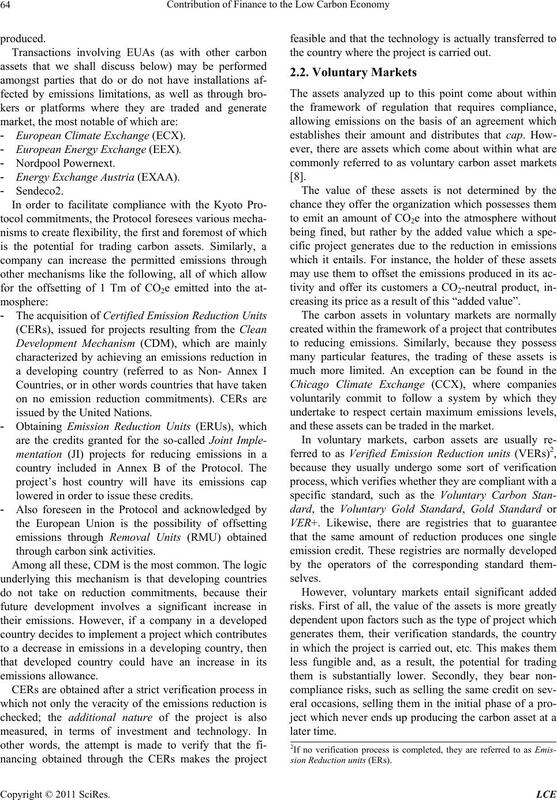 carbon emissions in business practice. work of that regulation or contract. due to a voluntary contractual relationship. projects carried out in other countries. easily in an organized market. 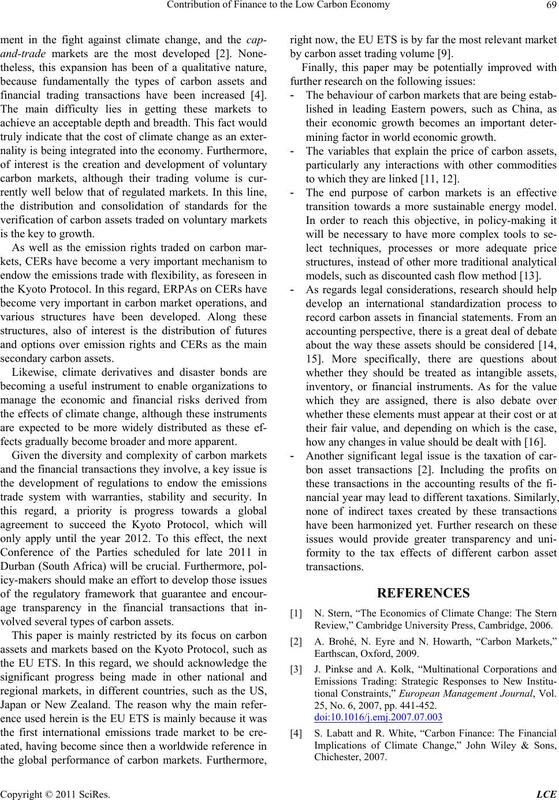 as regards to the emissions produ c ed in 1996.
their emissions by acquiring rights from third countries. rights and credits are specified i n CO2 equivalent units (CO2e). - European Climate Exchange (ECX). - European Energy Exchange (EEX). - Energy Exchange Austria (EXAA). issued by the United Nations. lowered in order to issue these credits. the country where the project is carried out. creasing its price as a result of this “added value”. and these assets can be traded in the market. per year and the price to be paid for them. they depend upon their investment and financing needs.  The value of those assets on secondary markets. leum, coal, natural gas, etc.  Interest rates, inflation rates, etc. would have a maximum in its amount. for setting a minimum amount in the contract. others grant ed by the p romoter. stance as the return on their investment. investments based on a low-carbon economy. 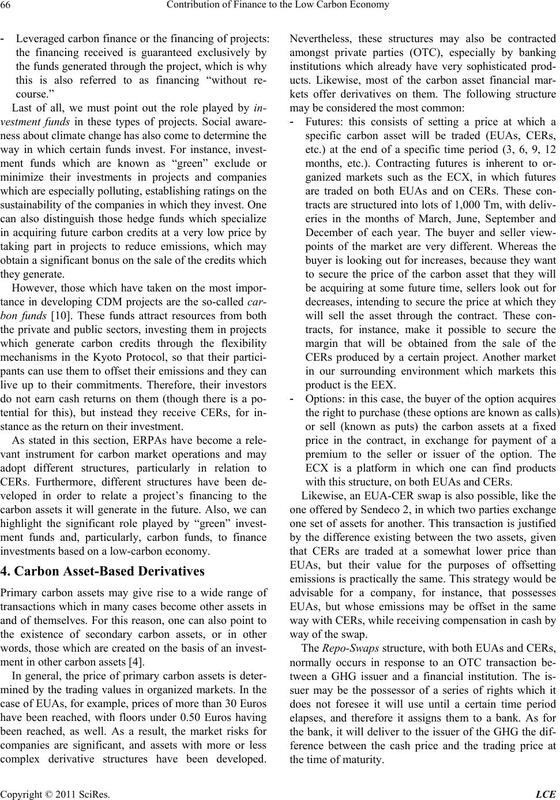 ment in other carbon assets . complex derivative structures have been developed. with this structure, on both EUAs and CERs. 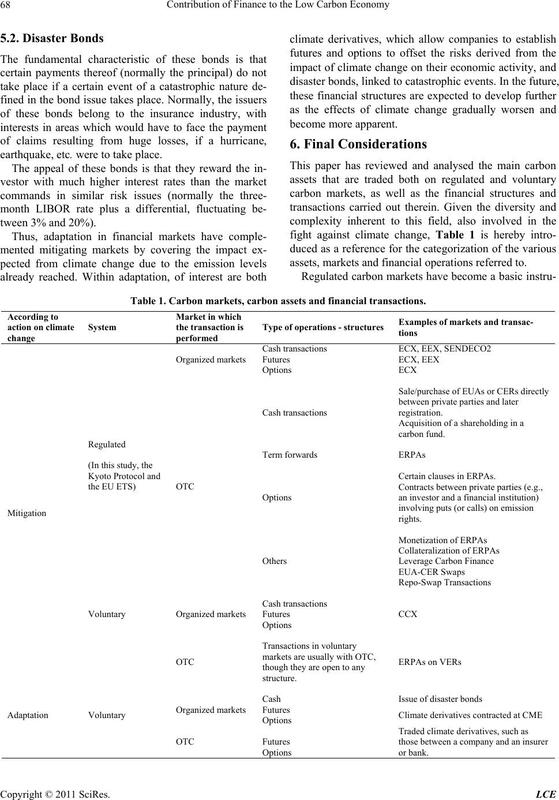 as well as other more specific carbon asset structures. international unification of their legal implications. 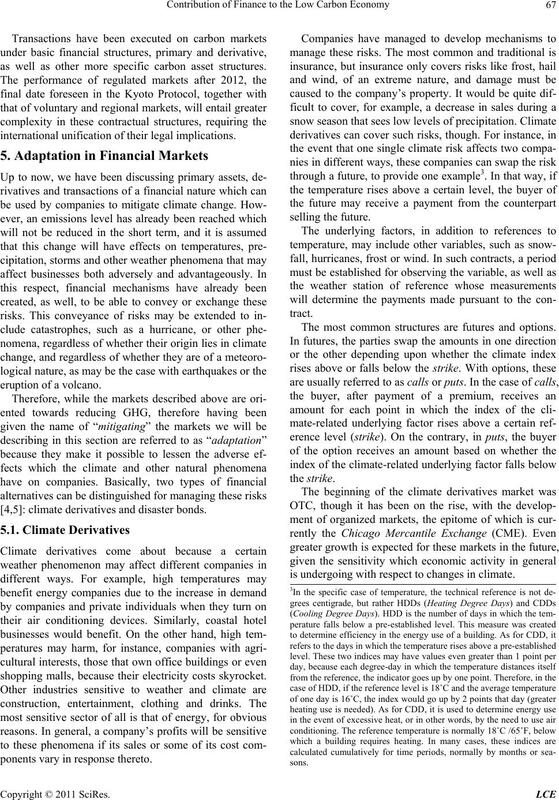 [4,5]: climate derivatives and disaster bonds. shopping malls, because their electricity costs skyrocket. ponents vary i n response thereto. The most common structures are futures and options. is undergoin g wi t h respect to changes in climate. earthquake, etc. were to take place. assets, markets and financial operations referred to. Table 1. 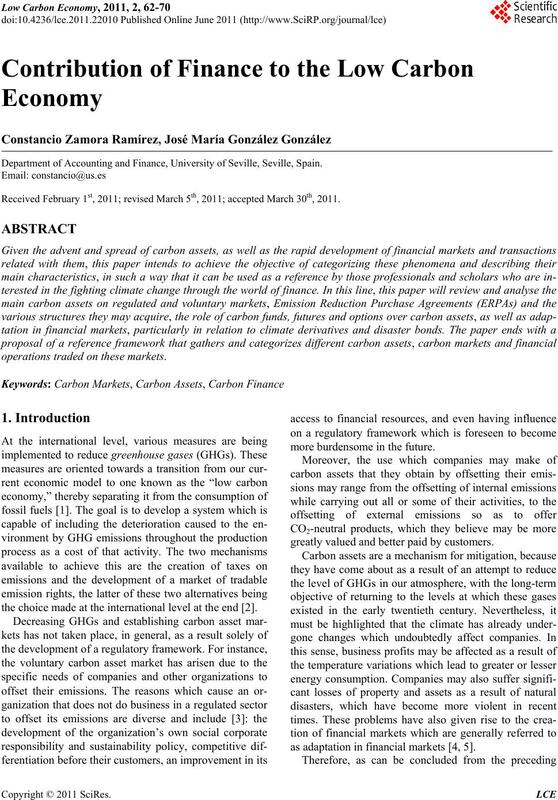 Carbon markets, carbon assets and financial transactions. financial trading transactions have been increased . is the key to growth. fects gradually become broader and more apparent. 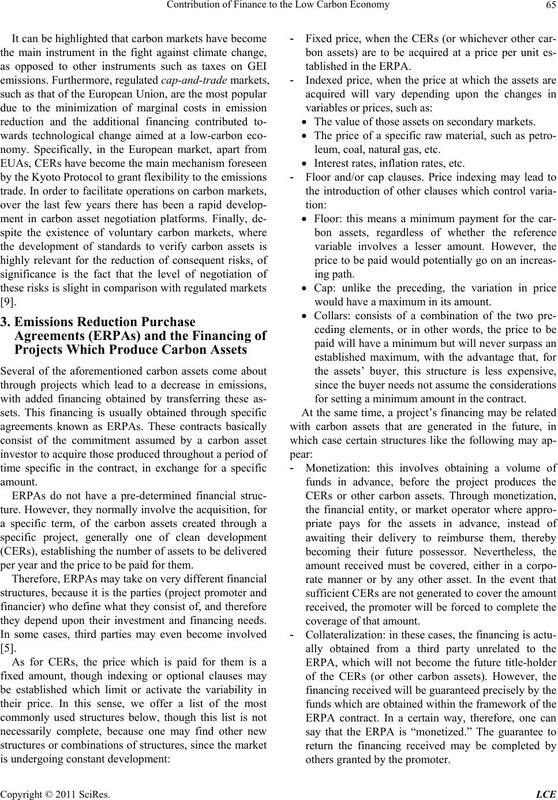 volved several types of carbon assets. by carbon asset trading volume . mining factor in world economic gr owth. to which they are linked [1 1, 12]. transition towards a more sustainable energy model. models, such as discounted cash flow method . how any changes in valu e should be dealt with . Review,” Cambridge University Press, Cambridge, 2006.
tional Constraints,” European Management Journal, Vol. 25, No. 6, 2007, pp. 441-452. A Credit Constrained World,” Risk Books, London, 2009. Vol. 50, No. 4, 2008, pp. 189-206. Markets,” 2nd Edition, Earthscan, Oxford, 2009. 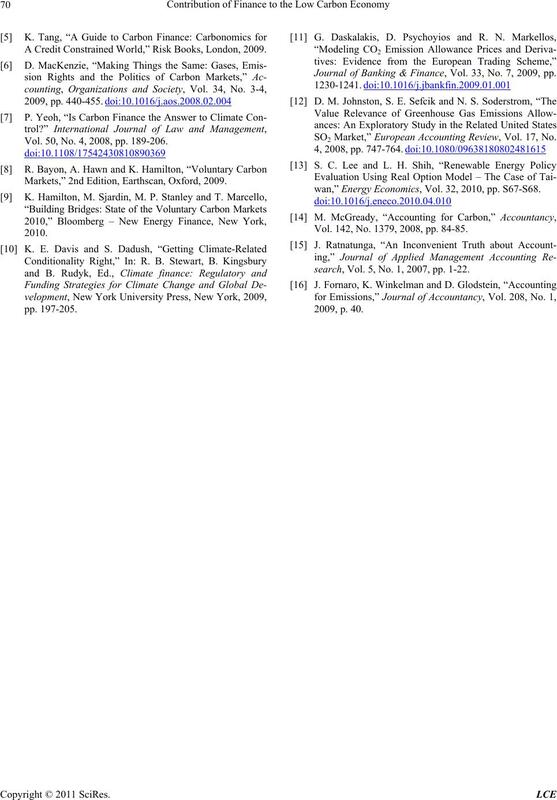 Journal of Banking & Finance, Vol. 33, No. 7, 2009, pp. 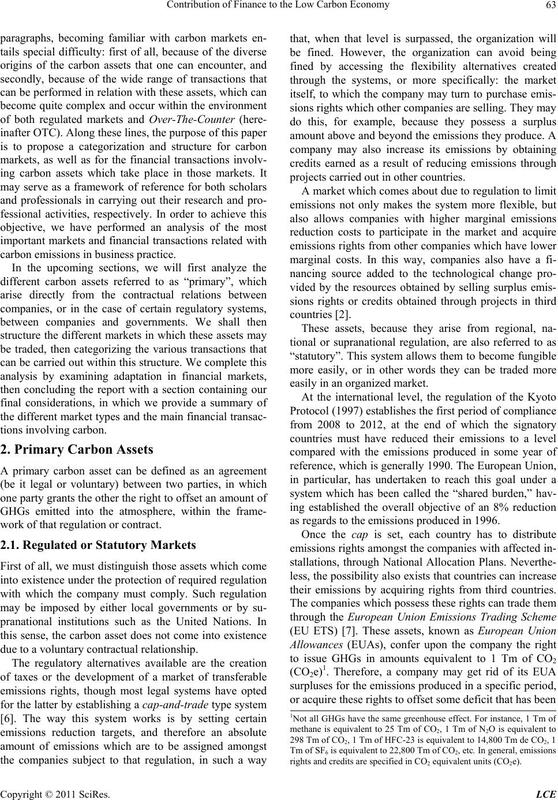 SO2 Market,” European Accounting Review, Vol. 17, No. wan,” Energy Economics, Vol. 32, 2010, pp. S67-S68. Vol. 142, No. 1379, 2008, pp. 84-85.
search, Vol. 5, No. 1, 2007, pp. 1-22.